It’s a dilemma that goes back to as far as Abraham and Isaac: if it meant satisfying your god and guaranteeing the lives and happiness of a generation of your people, would you be willing to sacrifice your child? Your own flesh and blood for the sake of millions? Could you do it? Should you do it? For an escape artist, Scott Free is surprisingly a very linear thinker. 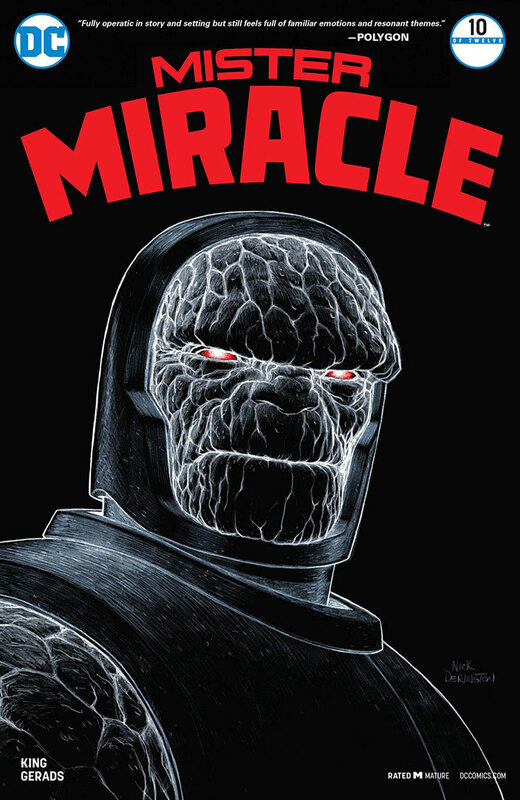 One would think that a man used to swerving death like a skateboarder on a crowded sidewalk would have the propensity for multi-dimensional thinking that could peer through Darkseid’s challenge, and find another way besides sacrificing his only son to the same fate he experienced as a child. But the thing about escape artists, perhaps, is that while they may be good at getting out of trouble, that doesn’t meant they’re good at not getting into it in the first place. Scott is a man who knows how to suffer. To suffer and then thrive. To rise above and to feel the sun on his face after a lifetime of darkness. But he doesn’t know what it’s like to simply live in the sun. And that’s a big part of what it seems Tom King is getting at with his characterization of Scott’s depression, suicide, and overall mental state. This world is crushing for him, this happy world. A world with balloons and Batman cakes and a condo and a son who never has to climb out of the fire pits of Apokolips to meet his destiny. It all weighs on him like an invisible pack, piled upon his shoulders, even hunching him, as Mitch Gerads so elegantly displays in panel after panel. Scott has Barda to pick up the pieces for him, time and time again. To be his defender. His tank. The mama bear. And now King and Gerads have been able to crack that armor every married couple that’s the least bit honest with each other should recognize a little: that illusion that being a one-sided, ultimate caretaker takes no toll. That being the strong one isn’t exhausting nearly every second of the day, in ways that you don’t even realize until much much later. Is it that Scott simply can’t handle being happy? Or is it that he understands that happiness to be a complete fabrication? A wavering signal from the television screen in his mind that indicates this all could be revealed to be no more real than a daytime soap opera? It’s the banality of scene after scene that Gerads is infusing into Scott’s daily life that feels so seductive and so unnerving at the same time. It reminds me of every moment of depression I’ve faced, while still having to get up and go to work and come home and do dishes and feed the cats — having to continue on in a “normal” world when everything inside my head felt anything but. And seeing that crack in Barda now too is at once comforting and again unnerving. But the real challenge King and Gerads are laying out is whether the ability of one child to avoid the scars his parents bear is worth the death of a million new gods and soldiers. And believe it or not, the creators are convincing me that it is. Not through comic book bravado or capes and cowls that are guaranteed to save the day. But in positing this idea of freedom from the weight that Barda and Scott bear, and what that freedom will mean, not just for little Jacob, but for everything Jacob is able to do for the rest of his life and beyond. Whoever destroys a soul [of Israel], it is considered as if he destroyed an entire world. And whoever saves a life of Israel, it is considered as if he saved an entire world. It’s counterintuitive, and in this case almost monstrous, to think of choosing to do nothing to stop a war that could claim millions over the comfort of a single child. And yet. Isaac was not meant to be sacrificed, truly. And these creators know that. His mother knows it. The drama lies in the escape, not the sacrifice.